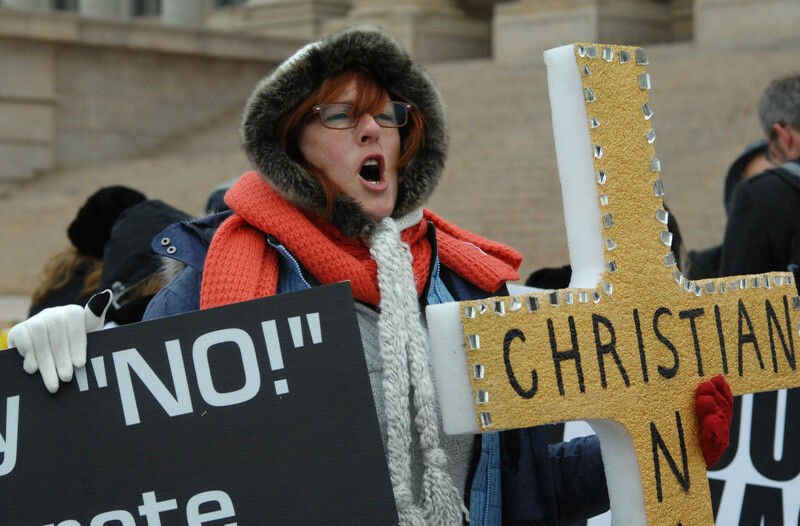 An anti-Muslim protester chants Friday on the south steps of the State Capitol building. Representatives of Oklahoma’s Muslim community, responding to complaints and criticism about their faith by some state lawmakers, came to the state Capitol Friday to learn how to become more politically engaged. The event drew more than 100 participants and about two dozen protesters. The protesters, many with signs, stood outside the Capitol’s south entrance chanting anti-Muslim statements. Adam Soltani, a spokesman for the Council on American-Islamic Relations, said the event was held to help educate people about the Muslim faith and to encourage Oklahoma’s Muslim community to become engaged civically. On Jan. 8, state Rep. John Bennett, R-Sallisaw, issued a media statement critical of CAIR and the Muslim community. “If CAIR Oklahoma really condemns terrorism and believes in First Amendment protections for everyone, they need to prove it by condemning the verses in the Quran that call for these violent acts and Mohammed’s hadiths that call for and justify violent acts,” Bennett’s statement said. In a scene similar to one at the Texas State Capitol in Austin in early February, a woman interrupted the event by reciting the Lord’s Prayer during a Muslim call to prayer and was escorted from the building by Highway Patrol officers. One unidentified officer said the woman was the same one who had protested in Austin, but that wasn’t immediately confirmed. The Austin protester was Christine Weick, who is originally from Michigan, according to news reports. She did something similar last year at the National Cathedral in Washington, D.C. The woman removed Friday was not arrested, just removed, so her name was not recorded, a Highway Patrol spokesman said. Soltani said the complaints about Muslims aren’t true. Several other lawmakers, including state Rep. Mike Shelton, D-Oklahoma City, met with representatives of CAIR and encouraged members of the Muslim community to become active in state and local government. Soltani said CAIR would return to the Capitol next week and distribute copies of the Quran. 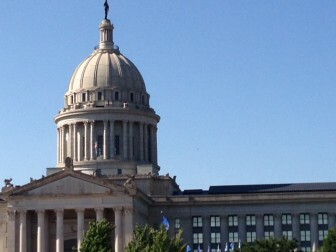 Despite a budget hole of $611 million, a court-ordered reform of Oklahoma’s child welfare system will be funded for the 2016 fiscal year, key legislative leaders say.